A motor vehicle report (MVR) provides a summary of the accidents and traffic violations a driver has incurred within a specified time period, typically three years. Auto insurers utilize these reports as an underwriting tool. Insurers believe that a person's previous driving conduct is a good predictor of his or her future behavior. They also assume that people with poor driving records are more likely to cause future accidents than drivers with good records. Motor vehicle reports are generated by the motor vehicle department (DMV) in each state. Many states provide two types of MVRs: an online version and a certified (paper) copy. The two versions contain identical data but only the certified copy is an official document accepted by courts. Insurers may obtain the records directly from the state or from a third-party provider. To order an MVR, an insurer generally needs an employee's full name, driver's license number, and birth date. The price of an MVR varies widely from state to state. According to Verisk (the parent company of ISO), the cost ranged from $4 to $30 in January of 2016. The average cost per record was $9.50. Insurers consider these costs when underwriting businesses that employ numerous drivers. 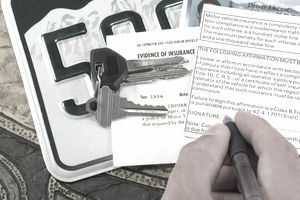 In states where driver records are particularly costly, underwriters may obtain MVRs on a few drivers when the policy is written and additional drivers at each renewal. License class. Examples are commercial and non-commercial. Civil traffic violations like speeding and running a red light. Provides the date and location of the violation. May also provide a description (such as speeding, 75 in a 55-mph zone). Vehicular crimes like DUI, reckless driving, and leaving the scene of an accident. Endorsements (applicable to commercial licenses only). An endorsement means that the driver has fulfilled the requirements to perform a specified activity, such as hauling hazardous materials or operating tank vehicles. Commercial auto insurers establish acceptability standards their underwriters must follow with regard to MVRs. For instance, an insurer may direct underwriters to reject any driver who has been convicted of a serious infraction such as DUI, reckless driving, or hit and run. The insurer may also tell underwriters to reject any driver who has, say, three or more moving violations (speeding, running a red light etc.) or two or more at-fault accidents on his or her record. Suppose your auto insurer informs you that a driver you employ does not meet the insurer's standards. What can you do? If the worker is a valued employee you can ask the insurer to make an exception in exchange for an additional premium. If the insurer refuses, you can place the worker in a non-driving position until his or her record improves. Another possible option is to exclude the worker from your business auto policy via a named driver exclusion and to insure him or her under a separate policy. A driver exclusion will complicate your insurance so it should be a last resort. Note that named driver exclusions are prohibited in some states. Image courtesy of [avid_creative] / Getty Images. When they obtain MVRs, insurers (as well as insurance agents and employers) must comply with privacy requirements under the Fair Credit Reporting Act (FCRA) and the Drivers Protection Act (DPA), both of which are federal laws. They must also adhere to any state privacy laws that apply to MVRs. The FCRA and the DPA allow insurers and insurance agents to obtain MRVs for underwriting purposes. As a general rule, insurers and agents may obtain these documents for such purposes without the driver's permission as long as they inform the driver that they are doing so. Agents are generally permitted to share MVRs with the insurers they represent as long as the records are used for underwriting. Some states require agents and insurers to obtain drivers' written permission before they order MVRs. Federal privacy laws prohibit insurers and insurance agents from sharing any data contained in MVRs with the drivers' employer without the drivers' written consent. Likewise, employers who obtain MVRs must secure employees' written consent before sharing MVR data with insurers, agents, or anyone else. If an employee's driving record does not meet the insurer's standards, the insurer can communicate that fact to the employer. However, the insurer cannot give the employer any details regarding the employee's driving record. For instance, the insurer cannot tell the employer that it is rejecting the driver because he or she has incurred a DUI as well as four moving violations. Some employers rely on their insurance agents to obtain MVRs on employed drivers. As noted previously, agents are prohibited from sharing MVR data with employers without employees' written consent. If you ask your agent to obtain MVRs on your behalf, be sure you obtain employees' written consent before you forward their personal data to your agent.